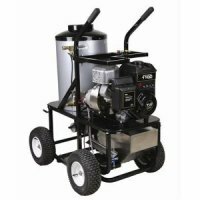 Hot water pressure washer models available on the market today are essentially driven by the same purpose which is to increase cleaning effectiveness beyond what can be achieved using a standard cold water pressure washer. The technology behind hot water pressure washers is such that water is heated to a high degree as high as 220 Degrees without turning into steam. This is what makes a hot water washer distinctively different from a steam cleaner. The purpose of hot water washer machines is to deal with the most sturbbon dirt that can be encountered on surfaces. This particulary refers to grease, oils, and grime accumulated over a period of time. Hot washers can also be used to sanitise certain surfaces getting rid of certain bacteria that will be killed at temperatures of 100 degrees celcius or 220 F. In most cases hot washers will clean without soap or detergents were cold water washers would need to clean with pressure washer soap. The following information even though basic in terms of understanding the basic principles behind a hot water washer will be useful should the need for your pressure washer troubleshooting arise down the road. Most hot water pressure washers use a combination of energy sources to produce a working hot washer. Electrical power usually connected from mains with an electric cord is used to power a pump that constantly circulates water in the washer system. Gasoline, propane, karosine, natural gas or diesel is used to fire the onboard burner that heats the water. For safety reasons, burners only work as long as there is water. When the water is swithed off the burner automatically shuts down. Due to the different elements that make up a hot washer, the machines are usually bulky and requiring mantainance. This is a hot water pressure washer from Northern Tool and Equipment specially designed for heavy duty industrial use. Selling at $6700.00 this 4000psi at 4 GPM flow is typically used in remote areas with no running water nor electricity. This is a highly rated hot washer by commercial business onwers. It has a an onboard water tank which can hold 200 gallons of cold water which is heated and can last a cleaning of 50 minutes of continous cleaning. This hot water pressure washer has massive power enough to knock a grown adult off their feet. it is used to remove graffiti, grease, paint, grime and oil from all sorts of surfaces one can imagine. This hot washer runs on the much acclaimed Honda engine. Honda pressure washers as it were are popular amongst many pressure washer owners especially of cold water washers. It also got a CAT66DX pump which is also highly rated creating a winning combination. 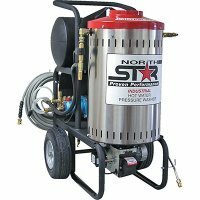 You may learn more about other available NorthStar pressure washers which are not necessarily hot water washers. - some problems encountered with the pressure release valve. This is NorthStar model 157307 and is also highly rated by satisfied users. Expect to spend up to $2200.00 for this hot water washer. It has a pressure power of 2000psi at a flow of 1.5GPM and uses 120volts for the pump that circulates water. This hot washer can be a good investment for use around the home and for any other commercial light to medium duty projects. It will give you great results on your deck, pavement, greassy driveway and oily garage floor. 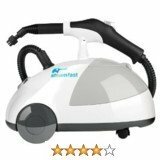 The steam that is especially produced by the accompanying steam nozzle can be used to disinfect surfaces. - the 50 ft hose leaves no markings on your surfaces as you drag it around. 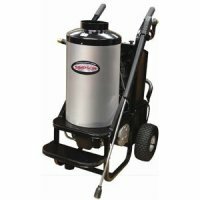 Follow link to read more reviews of heated pressure washers tthat we have done for you within this site. This pressure washer releasing hot water is a 3000psi at 3GPm flow from Simpson. It belongs to the King Brute series of pressure washers. It sells on average for $2500.00 and is medium to heavy duty washer in terms of output delivery. the burner on this hot washer is fired by diesel fuel. It runs on a Briggs and Stratton engine. This is were we raise a red flag about this pressure washer. Briggs engines are frankly our worst recommended engines because by experience many washer onwers have raised serious complaimnts about them. The most common problem is the problem in starting the engine. This is what makes Honda engines prefered. Briggs can take more than three pulls to start and should it shut down for a refueling it won't easily start when hot giving the user massive downtime. 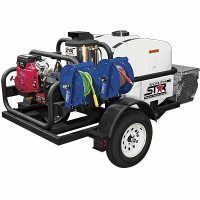 In fact and suprisingly Briggs and Stratton has manufactured pressure washers powered by a Honda engine. 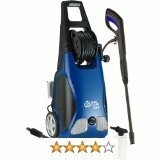 This Simpson Mini Brute hot water pressure washer is a typical home hot water washer. You may also use washer on commercial and industrial sites and even at the farm. At 1700psi with a flow of 1.8GPM this washer will achieve your home cleaning of grease, oil and grime which has accumulated for a long period of time. The washer burner is also powered by diesel fuel. The pump that circulates water is powered by an 120v electric pump. This washer comes with four quick connect spray nozzles. As a safety measure the washer automatically switches on and off when trigger is pressed or released. The 25 foot industrial rated hot water hose is durable and will handle rugged service.